In 1986 the Chernobyl nuclear reactor melted down, forcing the people who lived in the area to evacuate. Many of those who evacuated thought that they would be able to return home in a matter of days, but they were very wrong. One side effect of this exodus is that many pets were left behind while residents were fleeing to safety. 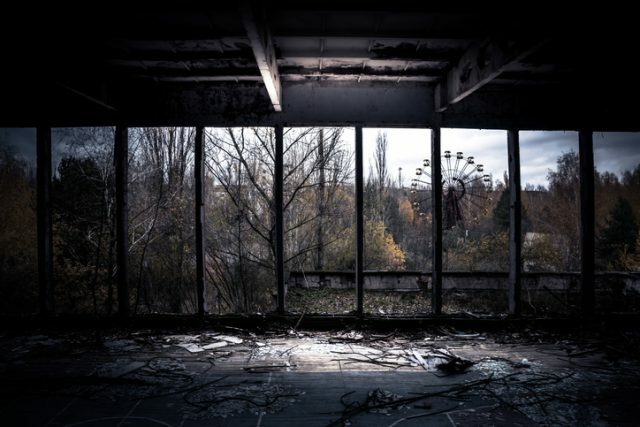 View of the horizon from inside the abandoned gym in Prypjat ghost town, Chernobyl. 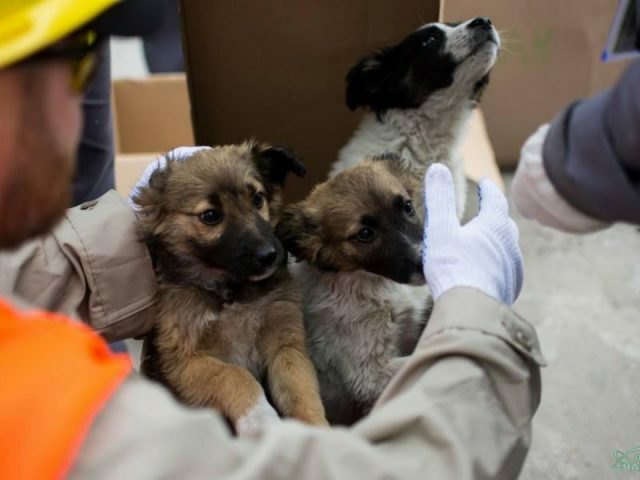 Military personnel were dispatched later to shoot any pets that they found in the zone, but a number of the animals managed to avoid being put down. Now, more than 30 years later, there is a significant animal population in Chernobyl — one that has lived there largely without any human contact or interference. 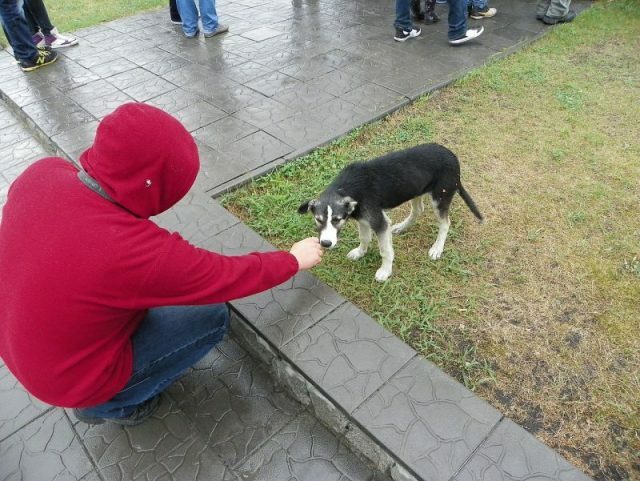 Among this population are a lot of dogs and puppies which are believed to be the descendants of the abandoned animals. Filmmaker Drew Scanlon made and uploaded to YouTube a short documentary showing footage of a number of the puppies and dogs that roam the 1,000 square mile exclusion zone. According to Huffington Post, some people are allowed into the zone: workers at the plant, some tourists, and a few others. Some of the residents who left the zone have quietly come back and returned to their villages, against government orders, as well. All of those people have been cautioned against touching any of the puppies, though, for fear of radioactive particles that may be clinging to their fur. Chernobyl, Ukraine – 26 November 2017. 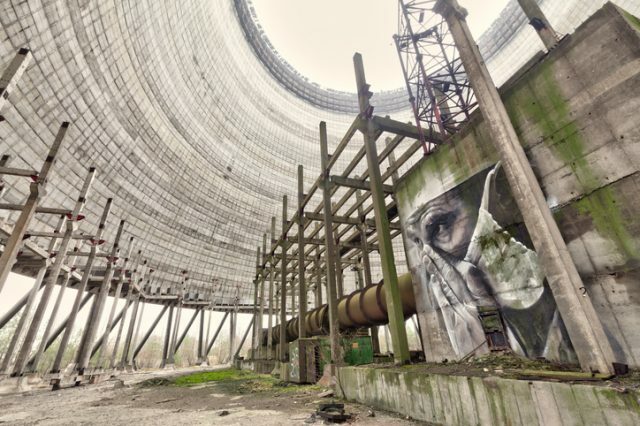 Inside of unfinished cooling tower of Chernobyl nuclear power plant block 5. The puppies’ circumstances are heartbreaking, but as of about a year ago, steps are being taken to begin to address their needs for care. A non-profit dedicated to helping manage the aftereffects of industrial accidents, the Clean Futures Fund, has stepped in to lend a hand. They developed a five-year plan to deal with the puppy problem by spaying and neutering all the dogs and cats they can, setting up stations for feeding and watering the animals, and providing a veterinary clinic to address their health needs. They got started in September 2017. One of the things the fund has been looking into is figuring out much radiation the animals have actually come into contact with. 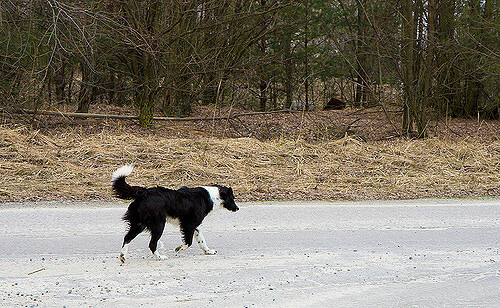 People may have strict limitations about where they go in the exclusion zone, but with homeless animals, limiting their movements is a fruitless exercise. They go where they want, lay where they want, and eat and drink where they find food and water, much of that still contaminated. Despite that, as of May 2018, a new initiative to begin preparing to find homes for some of the puppies began to take shape, according to IFLScience. 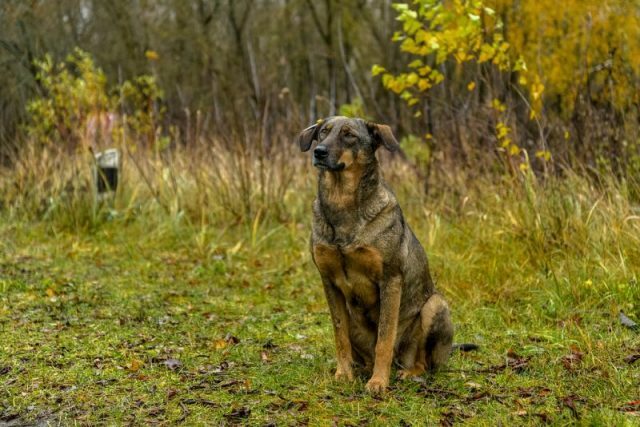 The State Agency of Ukraine on Exclusion Zone Management announced that 12 dogs had been rescued from the zone with the hope that they could eventually be sent to the U.S. for adoption. 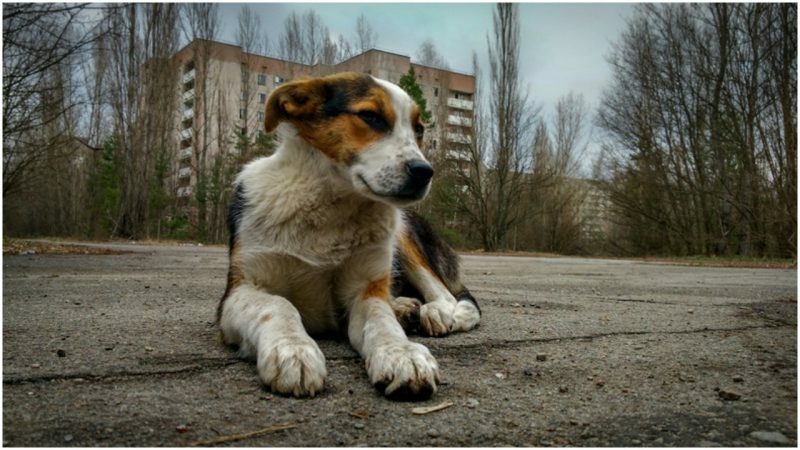 In the meantime, the dogs were being sent to a 45-day quarantine in the city of Slavutych, in order to not only make a closer health assessment and determination of level of radioactivity, but also to see how well the dogs might adapt to a life with humans. People magazine ran an article in May announcing that the first rescued dogs were available for adoption. The magazine reported that the puppies in question were all under a year old and were in the process of being decontaminated, and being socialized and taught basic commands. They were anticipated to be ready to go to permanent homes in the Ukraine and North America in July. The eventual goal is to find homes for 200 dogs, but the expectation is that it will be a continuing process taking as much as 18 months. In 2017, thanks to the partnership between the Clean Futures Fund and SCPA International, more than 450 animals were tested for radiation exposure, received medical care, vaccinations, and were spayed or neutered. The radiation testing revealed that the dogs living in the zone were not harmfully contaminated. Those results pave the way for their rescue and adoption by proving it is safe to place them in homes.